Your special day is around the corner and you're burnt out from all the wedding preparations, but you still have a wedding/bridal shower to plan! Well plan no further, this one is on us! 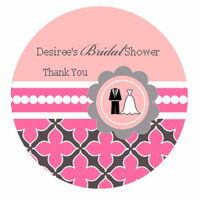 With our Wedding Shower Mod Party Kit, your only requirement is attendance! No need for a party planner when you have this adorable kit. It's literally a bridal shower in a box! Enclosed in this custom package is all you need, from precious cupcake toppers to elegant water bottle labels. Wedding designs like happy couples, hearts, and diamond rings are printed on each accessory to create a beautifully coordinated wedding theme. Simply invite and enjoy! You can further customize your event (for an additional charge) with our coordinating 2" round personalized labels perfect for garnishing any extra party favors! Simply add your names, date and/or personal message to create an exquisite wedding shower your guests will never forget!